The OEM Maverick X3 XRS long travel control arms have multiple weak points and are known to bend or break. 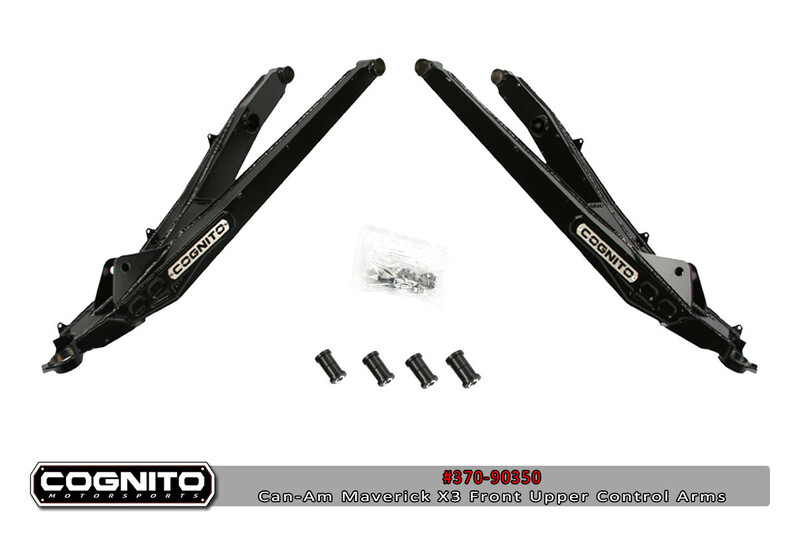 The Cognito Motorsports upper control arm is designed using a high strength chromoly boxed design. Our arms integrate a steering limiter similar to the OEM arms. This is unmatched by every competitor. The steering limiter saves CVs and axles from breaking by limiting the amount the tires are able to turn while the suspension is fully drooped. This eliminates from fully turning while in the air, so that during the landing, the CV joint isnÃ¢€â ¢t maxed out and the suspension quickly compressing causing damage to the axles. The Cognito Motorsports front lower arms replace the weak OEM arm with a unique 1-1/4Ã¢€Â DOM tubing design. Both arms replace the loud, loose OEM bushings with quality Delrin bushings. - Download installation instructions, CLICK HERE.